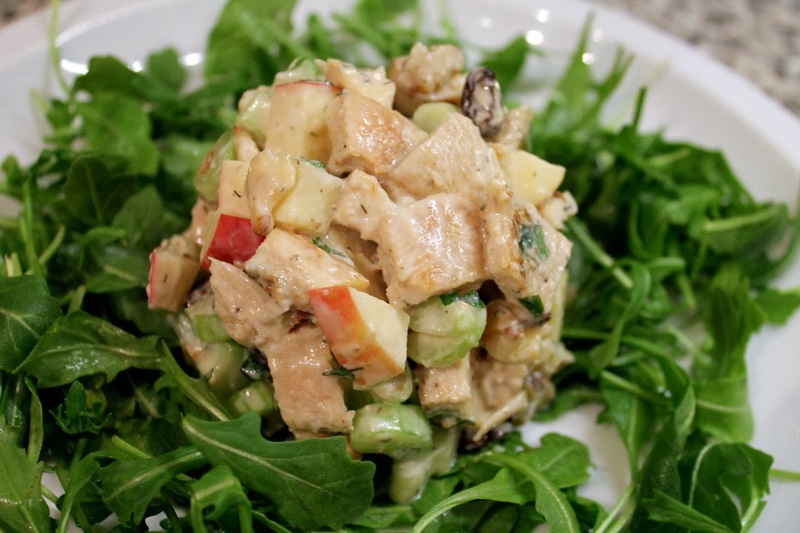 Concluding a week of all chicken recipes, here's a zesty chicken salad that's easy to whip up for a light lunch or dinner. 1. Heat olive oil in a medium frying pan over medium heat. Pat chicken breasts dry with paper towels and place in pan. Season with dill, garlic powder, salt and freshly ground black pepper and cook about 10 minutes, flipping the cutlets after 5 minutes, until cooked through and browned. Set aside to cool then chop into 1/2-inch cubes. 2. Combine the celery, apple, walnuts, raisins and mint in a large bowl. Whisk together the lemon juice, yogurt, honey and dijon mustard. Add to the salad and stir to evenly coat the ingredients. Serve salad over arugula leaves. This might be a simple dish but I like it a lot. Yum!